Dramatically reduce intake restrictions and get an impressive improvement in power throughout the entire RPM range with the Mazda SkyActiv Short Ram Intake System. MAF housings engineered to exact tolerances and manufactured using the latest in computer-aided techniques. Machined from 6061-T6 aluminium. Designed Specifically for Mazda: All CorkSport parts have been designed and tested specifically for Mazdas. Velocity Stack Design: Smooths the incoming air flow and increases the flow rate of air and reduces turbulence. 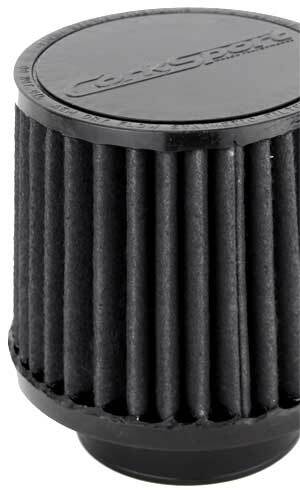 Durable Dry Flow Air Filter: Reusable and water resistant, this unique non-woven filter media does not require oil to filter and trap dirt and actually sheds dirt under engine vibration unlike cotton-gauze which holds contaminates until you clean the filter. Custom Reinforced Silicone Connectors: Constructed from multi-layer nylon braid to provide more strength and power and a smooth internal transition for less turbulence and optimal flow.